As I've said before, I only have one friend (that I know of) that doesn't like mac-n-cheese. The shame. In a pot cook macaroni until al dente. In a large saucepan, melt butter. Sift in flour and stir with a whisk for a few minutes, until smooth and bubbling (this eliminates the flour taste). Gradually pour in milk, while whisking, and bring up to a simmer, add pepper. Add cheese and sour cream and stir until melted. 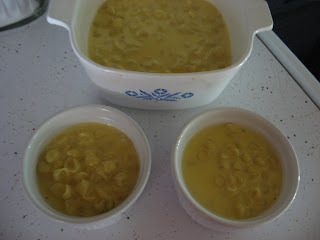 Mix with cooked noodles and pour into baking dishes. As you see, I set aside two ramekins for the next night's dinner. Can't beat mac-n-cheese two nights in a row! And of course, you can substitute any cheeses your little heart desires. In other happenings, we are getting ready to put a new roof on our house this weekend - BY OURSELVES. We have a group of friends coming over to help and I've been instructed to be on standby for any "errand runs" and meal prep. I'm going to have many hungry boys to feed! Thankfully we are going the easy route with cold meat sandwiches, burgers on the grill, maidrites, and of course a few home baked sweets by myself. Which reminds me - tune in tomorrow for Apple Taffy Pizza! i'm pretty sure i would NEED to make this in ramekins to prevent myself from eating the entire thing in one sitting. :) YUM! Wow cheesy goodness. Homemade mac & cheese is the only way I'll eat it these days. Thanks for a great, easy recipe! We've been on the same page lately with the mac and cheese and now the fruit pizza! Can't wait to see the apple taffy pizza tomorrow! it sounds great! now if i could just MAKE mac and cheese...goodluck with the roof! Good luck on you roofing job this weekend. Be careful. 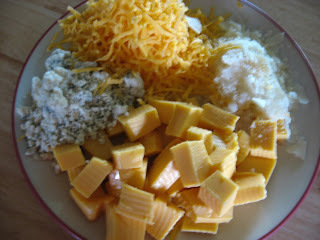 I make a killer macaroni and cheese and I've tried every cheese out there in it...except for bleu cheese. That puts such a different twist on the dish. i hate to say it, but i've never been a big mac and cheese fan! yours looks good...but i wouldnt touch kraft with a ten foot pole, even as a little kid! My little mac cheese eating kiddos would love, love, love this! Yum! Love mac and cheese here, never put feta in it before, it sounds great, thanks! This looks awesome!!! It's been way too long since I've made mac and cheese! Good luck with the roofing this weekend! It's supposed to be beautiful out! Thanks for linking to "Just Another Meatless Monday" Hope to see you next week! Good luck with your roof! At least you'll have a house full of boys to eat up this cheesy goodness! I don't know if I would be able to stop at one bowl...it looks so good.